Barcelona Photoblog: Bread and Coques, Help Yourself! Bread and Coques, Help Yourself! We are only three days away from the official arrival of spring on the northern hemisphere, March equinox, and I say official because at least in Barcelona we are having a wonderful fair weather since last week. Buds are sprouting from tree branches, people are talking outloud on bar terraces again or getting a tan on the beach. Over the weekend, thousands flee from the city and set to discover towns nearby in many different ways. Some are veteran excursionists and therefore insist on places they consider a favorite or consult with other experienced fellow travelers about secret troves. But the majority of mortals like me are used to dealing with randomness, trial and error methods and surprises whether they are good or bad. Sometimes we organize a trip to a historical site and then try local restaurants completely blindfolded (big mistake here!). Most of the times though, we first decide on what to eat and where and then if possible include the historical place, the celebration or the local market as an extra. In other words, we travel with the stomach. Local food markets are a fantastic wild card. You can kill two birds with a single shot. Say you blew it and couldn't find a comfortable restaurant where they made a good paella or tapas like some tasty chistorras from Navarre and Spanish omelette, for example, no problem. You run to the nearest stall and jump on the kind person behind the counter like Attila the Hun after crossing the Mongolian prairies, taking a good bite at all the sample food they offer for free, drinking from the wine porron on the house and then maybe, just maybe you buy a thing or two at the most. The cherry on top would be that you could bargain but they are not stupid either. 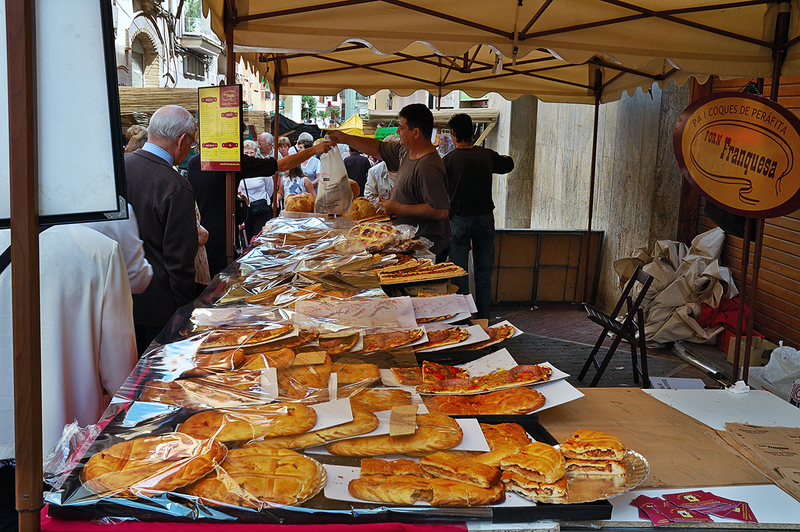 Please visit local markets and try local food like these Catalan coques covered with all sorts of ingredients. Notice in the image you also have bread and empanadas (pie). looks delicious ... you can not send a piece? yes please. I wish I was there to obtain the delicious breads. What a charming market with wonderful goodies. I feel like I'm there......now which will I sample first? ! Uhmm! qué buena pinta!! perfecto apora abrir el apetito! Aquí también hace muy bueno, pero no tenemos mar... :'( ... espinita no hay forma de quitársela! Great photo. Making me drool. I so wanna go there and taste it! I like your blog, it's my first time visiting. I found you by WeFollow.